Frances of Homemade Originals is the host of the current EtsyBloggers Blog Carnival topics. The topics? December 8 is "National Brownie Day" and "Winter Flowers Day." I love both topics -- so I'll blog about both of them (look for the 2nd one soon). There's something particularly magical about flowers that bloom when winter is raging outside. Years ago I worked at a wonderful old general store in Ann Arbor. We carried amaryllis and paperwhite bulbs and taught lots and lots of folks how to pot them up for indoor blooms. Those are the easy blooms -- the ones that normally grow outdoors (like hyacinths and tulips) are the difficult ones. You must force them, basically make them believe they've gone through a winter. Paperwhites, a type of daffodil/jonquil are beautiful but quite aromatic. Their scent is heavy and not always pleasant -- especially when enclosed in a small room. 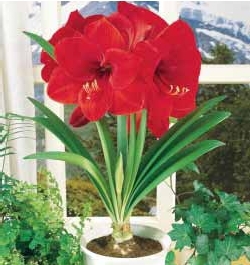 My preference is for the amaryllis, a strikingly beautiful flower. What do you do with an amaryllis bulb? I remember it all quite clearly. Use a pot about 1 inch larger than the bulb. We used 6" pots because the bulbs we sold were very large. The size of the bulb will relate to the size of the bloom. Pot them up with about 1/4 to 1/3 of the bulb showing above the soil. Water them sparingly. And wait... simple as that. Very soon a shoot of bud and leaves will emerge and grow quite quickly. You may have to support the stem if it gets too tall. ...and enjoy your beautiful, bloom as the snow falls outdoors! they are so beautiful. I always liked the paperwhites. Beautiful post, and thanks for the planting tips/instructions!